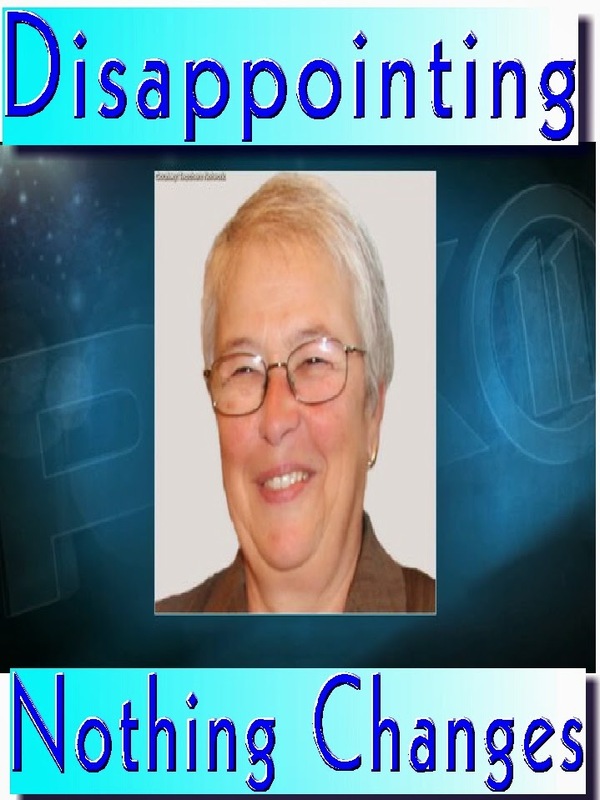 Chancellor Carmen Farina Is A Huge Disappointment. As we approach the end of another school year, let's look at what real changes Chancellor Carmen Farina has implemented in her second year as head of the New York City public schools. First, let's look at the few positives. Elimination of the useless money-sucking "Children First Networks". This was a no-brainer since this was the Frankenstein creation of Eric Nadelstern who replaced Carmen Farina in the Joel Klein Administration as she was forced to resign as Deputy Chancellor. Changing the experience criteria of the applicants to the infamous "Leadership Academy" from three years in education to seven and at least five years as a classroom teacher. Anti-Charter and leveling the playing field for all schools by no longer exempting the small high schools created under Bloomberg/Klein from accepting "high needs students" and artificially raise up their statistics. 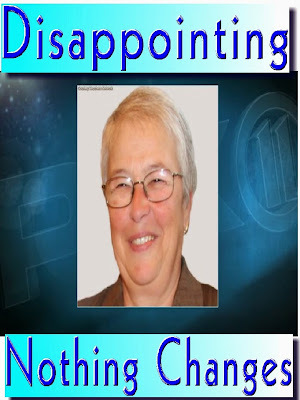 Unfortunately, for the parents, students, and teachers of the New York City public schools Chancllor Carmen Farina has far too many negatives. Here are the major ones. Failure to reduce class sizes as promised by Mayor Bill de Blasio during his campaign. New York City public schools have the largest class sizes in the State and have actually increased under Chancellor Carmen Farina. Froze already tight school budgets despite an economic revival that gave DOE a record amount of money to the agency. Continuation of the destructive "fair student funding" formula that shortchanges schools, created the ATR crisis, and forced principals to hire the "cheapest and not the best teachers" for their schools. Kept many of the Bloomberg/Klein appointees in policy making positions that translated in the continuation of the policies that make the classroom a hostile environment. Ill-advised elimination of the cell phone ban and a loosening of the student discipline code that has resulted in a more disruptive classroom. Failure to remove incompetent and vindictive principals and allowed the "double standard" to continue. Worse, she has failed to remove many of the 400 "Leadership Academy" principals that she stated should not be principals of their schools. Finally, her solution to the ATR crisis was no solution at all. In fact, it made the ATR a second class citizen with reduce "due process" rights and may actually increase the ATR pool over time. In fact, she is no friend of teachers at all. The Chancellor is a huge disappointment and I don't see much improvement until she retires for good and leaves the New York City schools to a competent Chancellor. 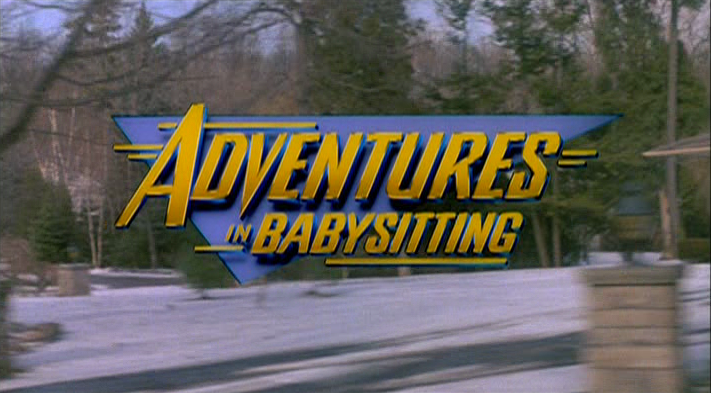 Arnie And Andrew Catch A Tiger By Its Tail. It certainly appears that Secretary of Education, Arnie Duncan, and New York State Governor, Andrew Cuomo, have overreached and are experiencing real pushback on their destructive education deform policies. Before Arnie Duncan, the basketball playing buddy of President Obama, took over as Secretary of Education, he almost single handedly destroyed the Chicago Public Schools and bullied the teacher union to allow excessed teachers from the many closing schools to find a new position within nine months or be taken off the payroll. 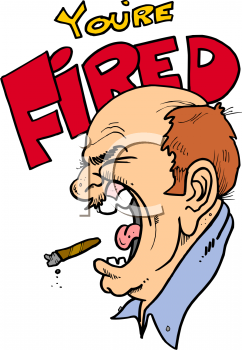 The result was many senior teachers found themselves without a position and were forced to leave the profession. Chancellor Joel Klein was so impressed with what Arnie Duncan did that he tried to emulate his actions by creating the ATR pool, with our union's approval. However, he wasn't able to pass the time limit provision past our union and was forced to swallow the $160 million in salaries in the DOE budget that exists to this very day. When Arnie Duncan took over as Secretary of Education, the high-stakes tests were used to evaluate student academic performance and were considered age appropriate. However, as the federal government pushed for a nationwide standard for all states. He convinced the Obama Administration to dangle money to bribe the states in adopting the Common Core based tests. This was known as "Race to the Top" (RttT). The RttT changed the education game completely, instead of testing student academic ability, using age appropriate measures, the RttT required that teachers be evaluated on test scores of their school, even when the students are not even theirs! To make matters worse, the Common Core based tests had no curriculum and were not age appropriate. In New York State the passing rate dropped from 72% to 31% and NYSED Commissioner John King called it a success. The RttT required that the more difficult and questionable Common Core based tests be used as part of the teacher evaluation system. Not unexpectantly, teachers that worked in high needs classroom fared poorly on the tests but were saved by the observations that were 60% of the teacher evaluation, compared to the 20% accounted for by the tests. However, Governor Andrew Cuomo reacted unfavorably to the low rate of "ineffective ratings" and wants at least a 10% "ineffective rate". The result is to increase the weight of the difficult Common Core tests from 20% to 50% to achieve his desired result. The Governor and Secretary of Education changed the educational landscape of NCLB by using the high-stakes Common Core tests as an instrument to rate teachers rather than to properly evaluate student academic achievement. In fact, Governor Cuomo put a five year moratorium in using the test scores against children until the Common Core based tests are deemed appropriate to adequately evaluate student performance. To this the Secretary of Education agreed to. However, when it comes to teachers, the Governor and Secretary of Education saw no problem in using the "junk science" to evaluate teachers. What hypocrites they are. For many teachers, rather than educating their students, they will spend the entire second semester doing unrelenting test prep. Parents are now realizing that their children are being forced to suffer through countless test prep and this will only get worse with the new teacher evaluation system. The result is a growing "opt out" movement that has exploded in the middle class communities throughout New York State, especially in Long Island. The latest "opt out" rates show over 200,000 students "opting out" for both the ELA and Math Common Core tests statewide. Moreover, in some communities there was an over 80% "opt out" rate. While NCLB held students accountable, the RttT hold teachers accountable. 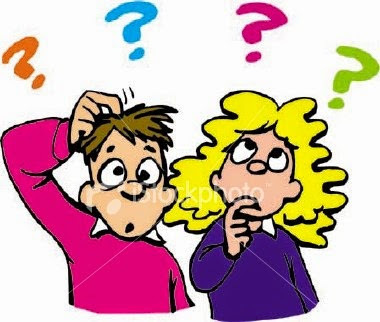 However, with the federal money attached to the RttT no longer available, many states are reconsidering the use of the Common Core based tests and reassessing the wisdom of evaluating teachers based upon the "junk science" of the Value Added Method. As the pressure from parents, teachers, and administrators mount against the use of the Common Core high-stakes tests look for a real backlash nationwide against the federal and State governments as "opt out" rates skyrocket in the years to come unless the education departments come up with more age-appropriate and less complex tests to properly evaluate both students and teachers. Confessions Of A Fired Charter School Teacher. Usually, I don't allow another person to use my blog to state their position. However, this charter school teacher's story is so compelling I felt it necessary to print the teacher's article that was sent to me, unedited. I was laid off from my “long term sub” assignment in a charter school in the Northeast Bronx on Friday. State science performance tests are next week, and then the 8th grade pretty much goes on field trips for the rest of the school year. So as far as the principal is concerned, teaching is over. So on Friday afternoon, after I’d come into work all week despite doctors’ orders to stay home (horrid ear infection), I was let go after a brief post-observation meeting. The principal chastised me for a rather trivial comment I made in after school test prep that apparently offended my co-teacher (who was there not to teach after school with me, but to apparently surf the web and eat lunch). But basically, I knew why I was let go: because they no longer needed a science teacher. I had been working there three months, and was by different estimates, either the sixth or seventh science teacher of the year. The students had lost count. One teacher apparently lasted all of a day before an altercation with a student gave him his walking papers. 1. The pay - many of them pay more than the DoE. The hours are longer, and true you barely get breaks between lunch duty, coaching sessions, coverages (charter school teachers are often absent an enormous amount at the end of the year as they know the axe is falling and some simply stop coming to work while others call out to attend interviews). But if you can take it, you do take home a sizable chunk of change … while you have your job. 2. There’s less harassment, at least at the charter school I was at. Admins at charter schools do not have to document poor teaching, or poor anything, to let a teacher go. You can be let go for any reason, or no reason at all. Contracts are rarely renewed after one year. So while you’re at your job, you do get to do it without the humiliating “documentation” public school admins foist upon targeted teachers. 3. School supplies - charter schools often have a mysterious hedge fund manager who bankrolls the school. So things like paper, notebooks, smart boards, pencils, markers, which are often in short supply at public schools are readily available in charter schools. 4. Discipline codes - although charter school children have the same discipline and behavior problems expected at any high-poverty urban school, the discipline code in a charter school is stricter and it is easier to impose punishments. The deans are not part-time teachers but full-time security types equipped to deal all day with behavior problems. Sending a kid to the dean’s office is often looked down upon in public schools but in the charter school I worked at it’s generally not a problem if a kid is acting out and disrupting the class for the child to be pulled and sent out. The deans I worked at were by far the best employees of the school — tough, practical, supportive of the teachers. 1. The “suggestions” that teachers donate money, raise money, or work at fundraisers. There were walkathons, receptions, more receptions, “happy hours” in which teachers were asked to bartend, and constant email missives asking teachers to “match” donations. Professional developments focused on whether teachers were “on the bus” or not — and “on the bus” often was a code word for willingness to participate in the endless fundraisers. 2. Teacher turnover - Most of the teachers were there for less than one year. The ones that stayed seemed to be personal friends with the principal or board of directors. Others often just left. No explanation was given, and that left the kids confused, as they would form a bond with the teachers and boom! the teacher was gone on Monday. 3. The lack of resources given to extremely special needs kids. The charter school I worked at had a very high population of SWD’s, and although they varied in skill and ability, some of the neediest kids were allowed to flounder in 30-pupil classrooms with little to no support. The “paras” I saw spent most of their time chatting on the phone or surfing the web on their iPads. In public schools these students surely would have been put in self-contained classes and get specialized services but at the charter school they were allowed to sit there, not knowing how to read, write, or (in one case) speak, and were often relentlessly bullied by other students for being “dumb.” It was a horrible environment for them and a scam on their parents, who no doubt thought that putting their children in a charter school would give them the individualized attention they needed. 4. The poor academics - it’s a myth that charter schools have better academics because they “counsel out” poorly performing kids. At the charter school I was at only 18% of the students were reading at a “proficient” level — actually worse than the DOE average. The students had the same academic challenges — poor reading and writing skills, but IMO their deficiencies were worsened by their schedules. In the morning in homeroom they were forced to read in absolute silence. Easier said than done for many students who really couldn’t read. Homeroom was by far the most challenging period of the day — many students literally shook with frustration as they were forced to read in silence. Others discreetly held a book to their noses but sometimes I saw they were holding the book upside down. Students were also referred to as “scholars” and constantly tested throughout the year. They were often given the message that their only value was how well they did on the CCLS ELA and Math exams. 5. The humiliating professional development session in which the school admins reminded us of how they were ‘actively recruiting’ for applicants. Sometimes these candidates would be brought into your classroom to do a demo lesson. It’s just the way the system works — contracts are rarely renewed after one year, but it contributed to low morale and towards the end of the year absences by teachers were staggering — sometimes maybe 30-40% of the staff was absent, presumably to go on interviews or maybe just to use their remaining sick days. 6. The 9 hour days that often translated into no breaks - sure, you were given a prep period. But many times you were pulled for coverages (many unpaid), for lunch duty, for meetings, and you were expected to work after school as well. It was an exhausting schedule and not one many teachers could maintain. Many teachers are very young, and live with their parents. One teacher said she felt “old’ — she’s 28. It’s very hard for people with families to maintain this kind of workload. But the strange thing is, the best part of working at a charter school is the best part of working at any school - the kids. Kids can be rowdy, disrespectful, unmotivated, difficult to teach, but I can tell you that I’d rather deal with the most difficult kids all day than to have those awful five minute “you’re fired” meetings with a principal. I guess we should be thankful we don't work in a charter school, subject to long, grueling hours, intense pressure to fund-raise, and being fired for no reason whatsoever. Over the years I have heard stories about how school administrators are not treating teachers with the proper respect due their profession. However, as the climate against teachers have been ramped up by the education deformer organizations and their political and media allies, this disrespect has seeped down into the school administration. This development is especially true in the New York City schools where many principals have treated their teaching staff as mere worker bees and not the educated professionals they are. Part of the problem is the DOE's Bloomberg era managers who instead of being fired when Bloomberg left office were retained by the disappointing Chancellor, Carmen Farina, and their punitive DOE policies against teachers were allowed to continue unabated. Another part of the problem was that 20% of the principals came out of the infamous "Leadership Academy" some with little or no classroom experience and have been trained to be the CEO of their school by applying the "top down approach" and dictating school policy. The final part of the problem is the Governor's disrespect for teachers and their union and takes every opportunity to impose policies that have no basis in improving student academic achievement but instead are aimed at terminating teachers. 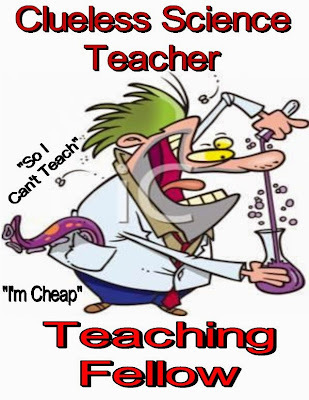 Examples of teachers being treated unprofessionally are two stories told to me by two colleagues in the last month who were threatened with a docking of pay after missing their Professional Development due to medical reasons.. The first case occurred in a large comprehensive high school in northeast Queens where the teacher, who was rated "highly effective" last school year, suffered a "heart attack" and despite a doctor's recommendation that he not return to school this school year, the teacher felt an obligation to help his students pass the Regents. The teacher was able to struggle through the first two weeks back despite not feeling well so he left after the end of his classes. However, on Monday of the following week. was a "Professional Development" (PD) day and his absence was noted by the Principal. The next day the teacher was called down to the Principal's office and was told he will be docked two hours of pay for his failure to show up for his PD. The teacher decided to retire on the spot, leaving the students with no teacher to prepare them for the Regents. The second case was in a small school in Southeastern Queens where a teacher informed the administration the week before that he will not be attending the mandated PD due to a long standing medical testing appointment, The administration gave its approval and the teacher, thinking that since he hasn't taken any time off during his three month assignment at the school, thought that everything was properly handled and left for his testing appointment. The next week he received an email that unless he supplied a medically certified letter showing the tests were medically necessary, he would be docked for the time. Luckily, the doctor had given the teacher a note and he had the time taken out of his CAR and not docked pay. If teachers were treated professionally, instances like these demeaning actions would never occur. In offices throughout the country if an office worker took an hour or two off, there would not be threats of pay reductions or demand for doctor notes. However, teachers are not being treated professionally and that's the issue. Maybe our disconnected union leadership should not be having a love affair with the Chancellor and demand that the teachers be treated with professional courtesy from her and her Tweed cronies. Moreover, they should be using member dues to run a series of commercials bringing back respect for teachers and their profession instead of using it for questionable causes. Union Wins Arbitration Giving Teachers Who Teach A Class Outside Their Schedule Pro Rated Pay. I have many complaints about our disconnected union leadership and they are too numerous to list in this post, however, there are times that the unions does fight for teacher rights and beats the DOE. This post describes the latest arbitration victory the union has triumphed over the DOE and its significant. Previously, they won their grievances on lesson planning, and SESIS payments, and now the right to receive "pro rated" pay for a sixth or pm class after the end of a teacher's schedule. An independent arbitrator just ruled that the DOE policy for paying teachers "per session" pay for either a sixth period outside their teaching schedule or doing pm school will be "pro rated" to a teachers actual salary, providing the class had at least a roster of 20 students and an attendance scan sheet was issued for the class. 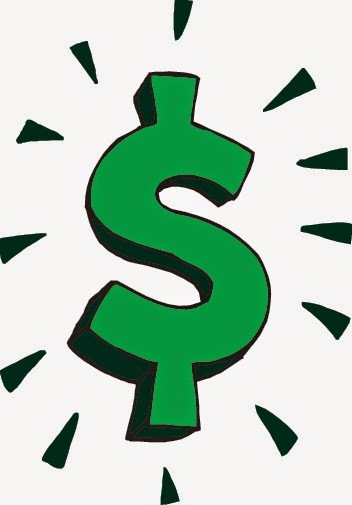 This arbitration agreement will date back to 2008 and that means that sometime this year many teachers can expect a check from the DOE for the difference for any teacher that worked in such a position and was paid "per session". According to my sources, if you are one of those teachers, the DOE has the records and will automatically issues the check without you doing anything but wait for the check. Hopefully, the corrected check will be issued sooner than later but knowing the DOE, it probably will be later. The Teacher Shortage Is Here! I have previously predicted a severe teacher shortage within five years. This prediction was based on fewer applicants going into the education field, especially the classroom. A colleague of mine works as an adjunct professor in the education program of a well respected university in the city and told me his schedule was reduced by half and fewer students are in his remaining classes. More importantly, when he surveyed his students. he found that 75% never intended to step into the classroom. 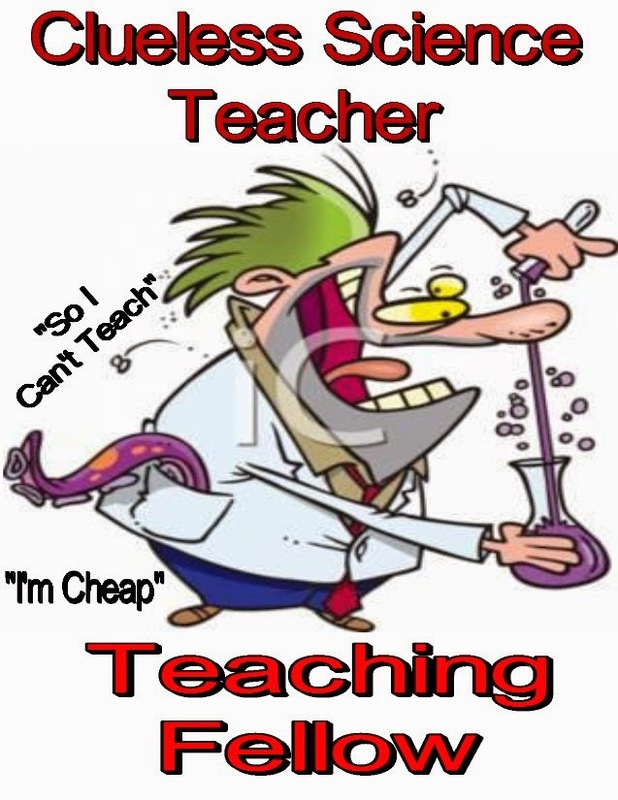 Worse, when high school students were polled about becoming a teacher, few considered the profession due to the media attacks on the teaching professionr. As for teacher preparation, there has been a steep drop in teaching applicants nationwide and especially in States like New York. Now it seems after years of recessionary austerity, the New York City suburbs are now hiring teachers for the first time since 2007. 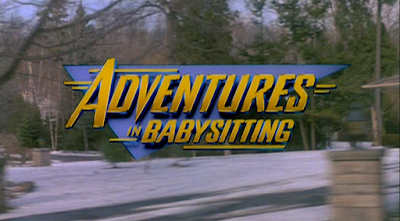 The extra State money, the lessening of the pension costs due to a more favorable contribution schedule, more teachers leaving the profession before being vested, the implementation of less costly pension Tiers (V and VI), and the austerity that cut the teaching force to the bone along with the increased retirements of the "baby boomers" has resulted in a hiring frenzy for the 2015-16 school year. The expectations are that over 1,000 new positions will be filled and over a 1,000 more will be hired to replace retirements throughout the New York City suburbs. If the more punitive teacher evaluations are as bad as predicted, look for increased retirements and a ever shrinking applicant pool to replace them. In a school in the building I am in, I heard an administrator say that they advertized a Math vacancy in the DOE's new teacher finder for the next school year and received no responses. Two years ago a similar Math vacancy had 25 applicants in the first two weeks! With the suburbs hiring, many potential applicants due to their attraction of the higher pay and better working conditions, the City cannot compete. Moreover, in New York City "quality teachers" will flee to the suburban schools for higher pay, lower class sizes, and a more disciplined student population. Teaching in the New York City schools is a high stress occupation with incompetent and poorly-trained administrators micromanaging the teacher, excess paperwork requirements, large class sizes, lax student discipline standards, and inadequate pay. For example, even with our raise, the average New York City teacher makes about $70,000 a year. While a suburban middle class school district averages over $100,000. That means that the average New York City teacher is making 30% less than their suburban colleagues. For example, the top salary for an East Islip teacher is $147,000 while the top salary for the New York City teacher is $105,000. Is it any wonder that teachers are fleeing the City classroom for the more pleasant working conditions of the suburbs? I thought the teacher shortage would take some time to materialize but it seems that the ever worsening classroom environment and the union's failure to get the DOE to remove the "gotcha system" that makes the classroom a hostile environment, has resulted in many teachers leaving the system and create a real hiring shortage of "quality teachers" down the road as the best candidates go to the suburbs and many others flee the system for higher pay and better working conditions. You would think that the DOE would do their best to retain their teachers, instead the DOE's "education on the cheap" policy has resulted in an exodus of "quality teachers" as their "fair student funding" policy ensures its recruitment over retention at the expense of the students academic achievement. The Thinning Of The Herd Against ATRs Are Beginning. I have been called by a couple of panicky ATRs who have told me that they were served with their 3020-a papers this week. In all the cases they are being charged with incompetence as they received two consecutive "unsatisfactory" ratings for the 2013-14 and apparently the 2014-15 school years, even though the year is not yet over. 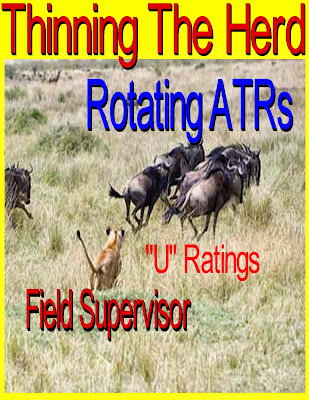 In all the cases two different field supervisors have rated the ATRs as "unsatisfactory" and will claim that they offered a "plan of assistance" at the teacher's 3020-a hearing. However, the field supervisors "plan of assistance" is simply a piece of paper and offers little real assistance to a teacher that rotates into different schools weekly, or monthly and who knows little of the students they are supposed to instruct. Moreover, since the ATR has no ownership of the class or their grades, many students in poorly performing schools (and there are many) simply refuse to follow directions, knowing there is no consequence for their refusal to do the work. Even the best teachers put into the position of the ATR would have trouble maintaining stringent classroom management and getting all the students to follow directions. Now these poor souls will be put through the 3020-a process during the 2015-16 school year and if my suspicions are correct, will be in great danger of being terminated by the new, more stringent 3020-a procedures against educators currently being implemented by the DOE and UFT, where the burden of proof appears to shift from the DOE and to the teacher in a secret February 24, 2015 meeting as reported by Betsy Combier in her blog. While I believe even under the newly tweaked and less favorable 3020-a process, it still will be difficult to terminate these teachers since the teacher can show that the "plan of assistance" was simply a ploy and lacked real substance in helping the ATR to become a better teacher. Hopefully, the NYSUT attorneys will aggressively blow gaping holes in the bogus "plan of assistance" and bring out the problems of instructing a class that you don't even know the names of the students to save these ATRs who are charged with incompetence their jobs and the retro pay they are entitled to. 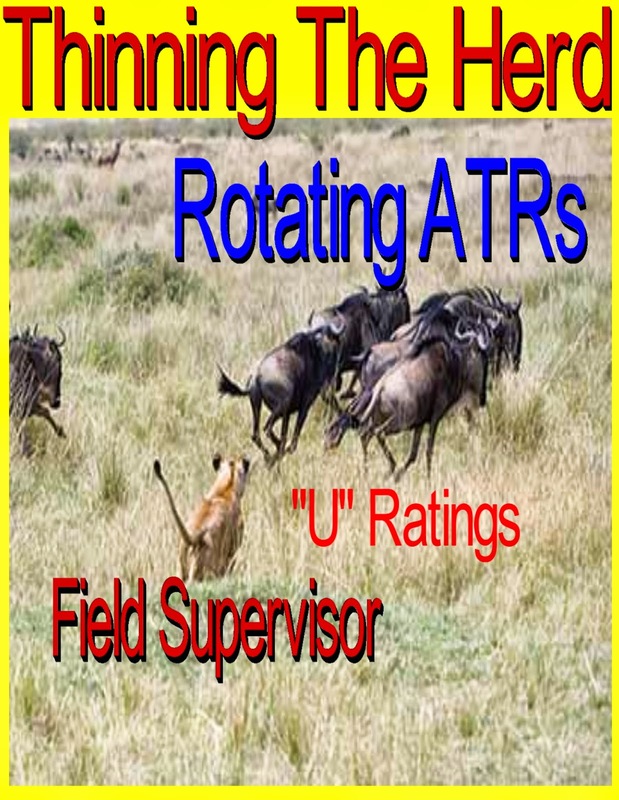 The DOE's goal for 'thinning of the herd"of the ATR pool is now in overdrive and we can expect many more horror stories of ATRs being served with their 3020-a charges until the end of the school year. Why Is There No Contract Book? After every contract the UFT publishes a book on the new contract that members can review and cite when administrators demand that a member do something that may be forbidden in the contract. However, its been almost a year since the UFT and the City agreed to a new contract and yet there is no contract book, why? Is our disconnected union leadership hiding some unpleasant news that diminishes member "due process rights"? Again, why don't we have a book that clearly spells out the new contract? Part of the answer that there is no contract book may lie in the changes in the educator 3020-a process that are being implemented in a secret meeting on Feb 24, 2015 between the UFT and DOE that required all NYSUT attorneys, DOE lawyers, and 3020-a arbitrators to attend as reported by Betsy Combier in her blog. What happened at that meeting? Good question. So far the meeting talking points are top secret and the DOE has refused to provide the information to Ms. Combier, despite her repeated FOIL requests. What are they hiding? Eventually, the DOE will have no choice but provide the information to Ms. Combier and we will all know what the changes in the 3020-a proceedings will be going forward. I suspect the changes in the 3020-a process will diminish the "due process rights" of the educator and result in the burden of proof shifting from the DOE to the educator at the 3030-a hearing. The probable result will be a rise in educator terminations and resignations and more severe "awards" to the DOE in the form of suspensions without pay and/or major fines for the fortunate few who escape termination. For the naive who believe our union is there to protect you. They have already agreed to make excessed teachers (ATRs) a second class citizen with "forced placements", mandatory interviews, and terminations due to a finding of "problematic behavior". Moreover, the DOE assumes that the ATR voluntarily resigned if they miss two mandatory interview, and most of all, an expedited, one day 3020-a hearing! All agreed to by our disconnected leadership. I hate to be paranoid but why else is there no book on the new contract, unless the union is hiding some very disturbing facts from the members and don't want us to know the true scope of the "givebacks" the union gave the DOE. I hope I'm proven wrong but I highly doubt it. 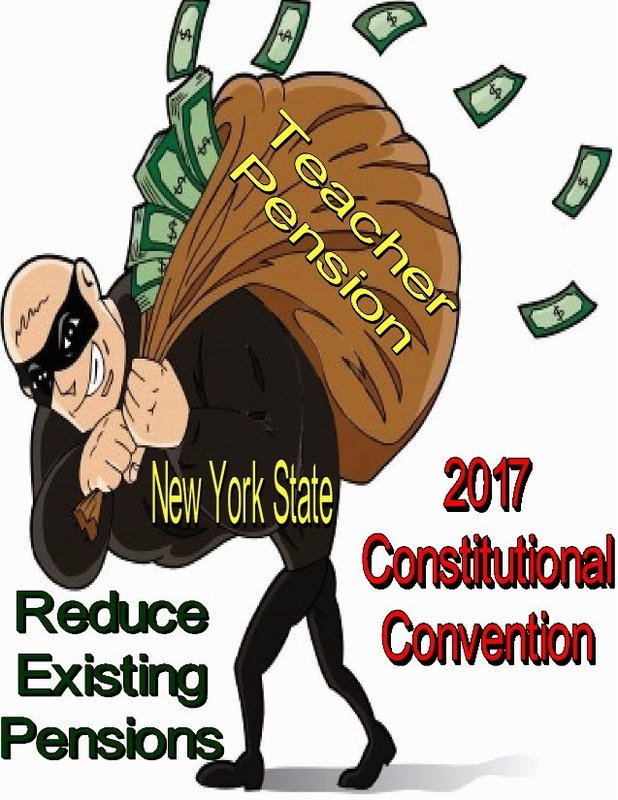 There are rumors that Governor Cuomo will go after existing teacher pensions in 2017 by calling a constitutional convention and changing the State constitution to reduce pension benefits. However, there is a question whether he could do it and a problem if the Governor actually intends to do this since its highly likely that existing pension benefits will remain unscathed no matter what happens. First, the New York State constitution states that "benefits cannot be diminished or impaired" and even if a constitutional convention tried to change that clause, the unions would tie it up in the State and Federal courts for a decade or more and the likely result would be no changes for existing pensions or workers hired under the old State constitution. Second, its highly unlikely that the Democratic Assembly would agree to do this and face the wrath of the unions which would jeopardize their elections going forward. Yes, they caved to the Governor on the teacher evaluation system because our disconnected union leadership allowed it. This would be very different since it destroys a covenant between the the State and its public workers and the entire unionized work force would mobilize against it. Third, the State constitutional changes would have to apply to all public workers not just teachers to pass even the preliminary rounds of constitutional challenges in the courts. Finally, the Illinois Supreme Court has unanimously struck down that State's revised pension system that tried to diminish existing pension rights and also questioned the futility of having a constitutional convention that would allow it to do so. This will be cited as precedent in any New York State attempts to do the same thing. The bottom line is that all this may be moot as the Governor's popularity is rapidly sinking and picking a fight with the state unions would not be in his best interest. In other words, I don't believe that our pensions will be affected, no matter what happens in 2017. The Racial And Income Composition In School Districts Affects The "Opt Out" Numbers. The above values show that combined, a total of 283,000 students have "opted out". Moreover, when the NYSED eventually and reluctantly release the final "opt out" numbers, the number will soar over 300,000, which is well above the whisper number of 250,000 that the "opt out" organizations were predicting and over three times higher than the State was expecting. The hotbed of the "opt out" movement was the solidly middle class communities in the New York City suburbs, especially Long Island. While the lowest "opt out" rates were in low income minority school districts. On Long Island I compared the various "opt out" numbers in Math from the different communities by income. The income (and racial) disparity is very evident as the solidly middle class communities in Long Island had "opt out" rates above 50% while the wealthier communities saw about a 25-35% "opt out" rate, or one in three or four. By contrast, the "opt out" rate in the poor minority communities were in the single digits. I can only speculate that poor minority parents didn't "opt out" their children either out of fear of being targeted, especially if the parents are undocumented, or they are not informed about how useless and time consuming the test is. In any rate the "opt out" rates in poor and minority communities are low. It's very obvious that the better informed the parent is, the more likely they "opted out" their child from the useless State tests and this shows up in the "opt out" statistics. Maybe the NYSED and the politicians will come to realize that their top down management is not the answer to closing the academic achievement gap but I'm not holding my breath waiting for that to happen. For another take of how useless these State tests are, read the NYC Educator blog. To Our Union. Treat The ATRs With Respect And Make Them A Chapter. The union has a chance to right a terrible wrong when they agreed to the Absent Teacher Reserve (ATR) in the 2005 contract. I remember Randi Weingarten saying that the DOE would never agree to pay teacher salaries without a classroom assignment. How wrong she was! 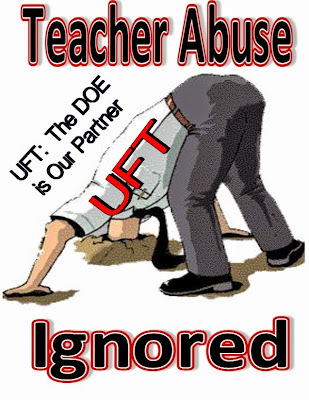 Even when the DOE refused to appoint ATRs in the schools that had vacancies in their licensed area, the union believed the situation was temporary. In fact, the union still claims the ATR pool is temporary after a decade of existence and that's why the disconnected union leadership refuses to make an ATR chapter. Since when is a decade old policy temporary? One of the union's favorite themes was when the Bloomberg administration leaves, so will the ideology and the ATRs will be placed back into the schools. However, with a new Mayor, the anti-Bloomberg, nothing changed. 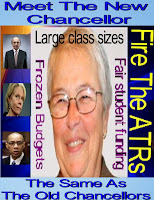 The new Mayor appointed the disappointing Chancellor, Carmen Farina, who was part of the problem back when she was a Deputy Chancellor in the Joel Klein years and not the solution, nothing really changed with the ATR mess. In fact, it got worse under the disappointing Chancellor, the ATRs became second class citizens with diminished due process rights. In other words, the Bloomberg ideology continues and so does the ATR crisis. 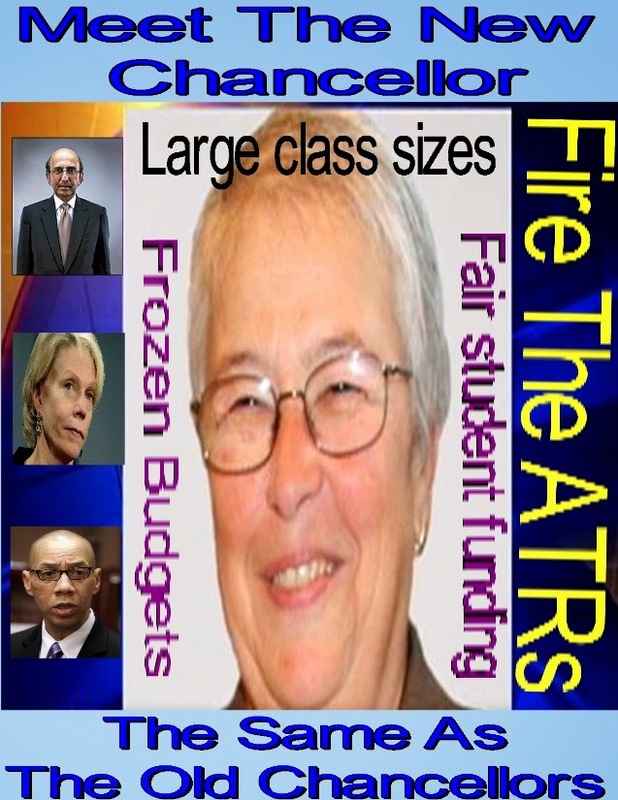 Now the UFT's executive board has a chance to partially right a wrong and acknowledge that the ATR pool is here to stay, at least until the end of the current contract (2018) and its time to make an ATR chapter and give the ATRs the representation they deserve. Hear that Unity? New Action? Or are you both deaf to the wishes of over 2,400 of the members. When It Comes To Credit Recovery, It's Still The Same Old DOE. I have been following the disgusting "credit recovery" saga at John Dewey High School in Brooklyn where another terrible "Leadership Academy Principal" , Kathleen Elvin, has been abusing her authority and has a bogus graduation rate. Despite an OSI investigation that has been completed, the DOE has done nothing about disciplining the school's administration. The school came on the radar after the New York Post wrote an article questioning the significantly higher graduation rate at the school. Now it turns out that the Principal and her administration has been graduating students who didn't even bother to go to class and violated the "credit recovery" requirements that the State and City agreed on back in 2012. A prime example was "student King" (not his real name) who Juan Gonzales of the Daily News wrote about in his article. The student, who apparently never went to many of his classes was allowed to graduate by taking massive amount of "credit recovery" online courses, all at the same time! 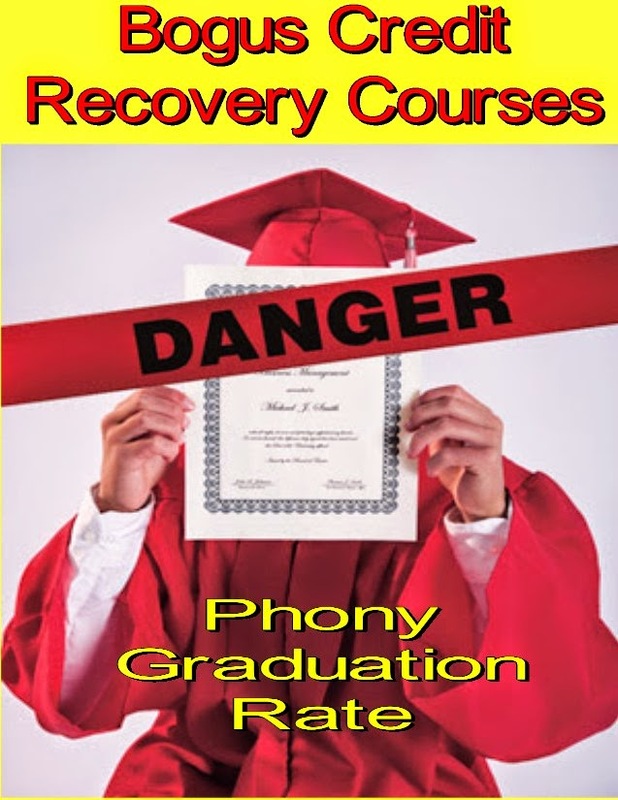 This violated the State and City "credit recovery" requirements that limited students to only three credit recovery courses in the core subjects during their high school career. 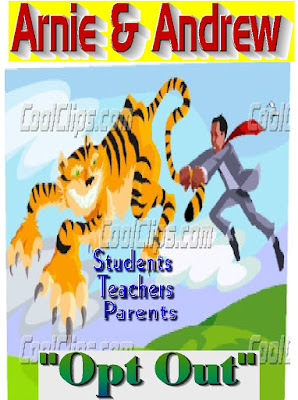 What did the Principal do that violated the "credit recovery" rules? Let me count the ways that "student King" was allowed to graduate without showing that he obtained adequate academic skills. Failed to attend class but was still allowed to take online credit recovery courses. Did not have teachers licensed in the subject area he was allegedly supervised in. Never was tested to show mastery in the subject as required. Took 7 "credit recovery" courses in core subjects just in the Spring.of 2014. Took 11 "credit recovery" courses while also carrying a regular load of 9 other courses in the last school year. Received credit for 5 courses in the same "0" period, with no teacher. Received credit for 6 courses after school in the same Spring semester. Despite an OSI investigation that was completed last school year, the DOE and the disappointing Chancellor, Carmen Farina, has taken no action and remains silent on the apparent abuse of the ":credit recovery" rules. This brings into question the graduation rate of the school and the methods used by the Principal and her administrators to increase the phoney graduation rate of the school. Worse, despite the end of the Bloomberg era, when it comes to DOE policy making, its still the same old DOE, complete with their "double standard". Here is what one student thinks of Principal Kathleen Elvin on Ratemyteacher.com.